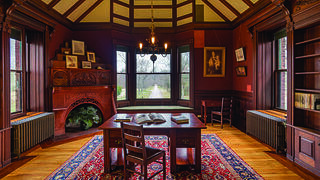 The second-floor library of the Eustis Estate looks out over an allee designed by landscape architect Ernest Bowditch. With its 2012 purchase of the Eustis Estate in Milton, Massachusetts, Historic New England acquired a masterpiece of Queen Anne-style design, the house had been well preserved, with one exception—the wall colors. Four generations of the Eustis family, who lived in the hilltop mansion from its completion in 1878 to 2012, had taken good care of the property. But as tastes changed and the original wall colors darkened, they coated most of the walls with light-colored latex paint. Engineer W.E.C. Eustis and his wife, Edith Hemenway Eustis, commissioned architect William Ralph Emerson to design their home using the newest architectural ideas. Emerson, a distant cousin of Ralph Waldo Emerson, created a building filled with floral tile work, stained glass, and intricately carved woodwork. The house is a testament to the Aesthetic Movement’s belief in beauty for beauty’s sake. Microscopic paint analysis revealed that just below the latex were deep reds, forest greens, and ambers, some mixed with metallic particles to make them shimmer. In the parlor, conservators stripped off the latex with duct tape to reveal amber paint dusted with clouds of bronze, nearly all intact. They returned the great hall to its original red, using multiple layers of hand-ground paints. By this past May, when the house opened to the public, the entire first floor sang with color. The bold wall hues matched the rich tones of the tiles and woodwork, once again unifying Emerson’s vision. 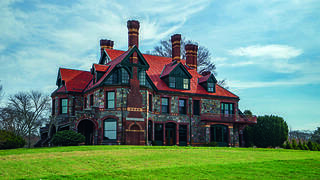 The exterior of the Eustis Estate in Milton, Massachusetts.